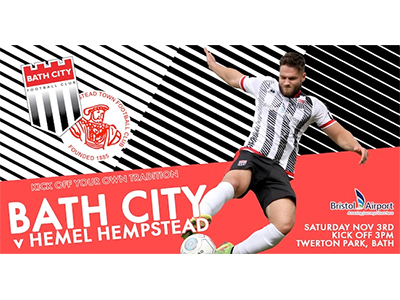 After seven weeks away from home league action, City return to Twerton Park sitting in fourth place in the Vanarama National League South. The Romans take on the Tudors looking to continue the fine league form that’s seen us win four, draw one and lose one in the last six matches. In a tight league, Hemel are 11 places below City but just six points behind, with three wins, a draw and two defeats in their past six suggesting form not dissimilar to our own. Last season we met the Hertfordshire outfit three times, despatching the visitors in convincing fashion in the Cup, but sharing the spoils in both league matches. After a record Community Day crowd last time out in the league, we’re hoping for another good crowd this Saturday with Student Day promotions likely to swell the attendance and add to the atmosphere. We look forward to seeing you there. Up the Romans!